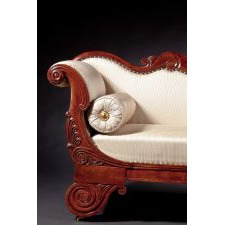 Each with a highly figured, shaped crest with carved volutes above an upholstered back and anthemion-carved broken scroll arms, the upholstered seat above a paneled seat rail raised on lotus-carved volute feet, on castors. 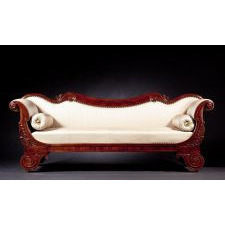 Height: 35", Length: 87½", Depth: 24¼"
Condition: Excellent: Old repair to the top of one arm, modern upholstery. The design source of the broken-scroll arm can be seen on Plate XIX of Thomas Hope's Household Furniture, 1807 and is closely related to a design on page 10 of Thomas King's Modern Style of Cabinet Work Exemplified, (London, 1829). 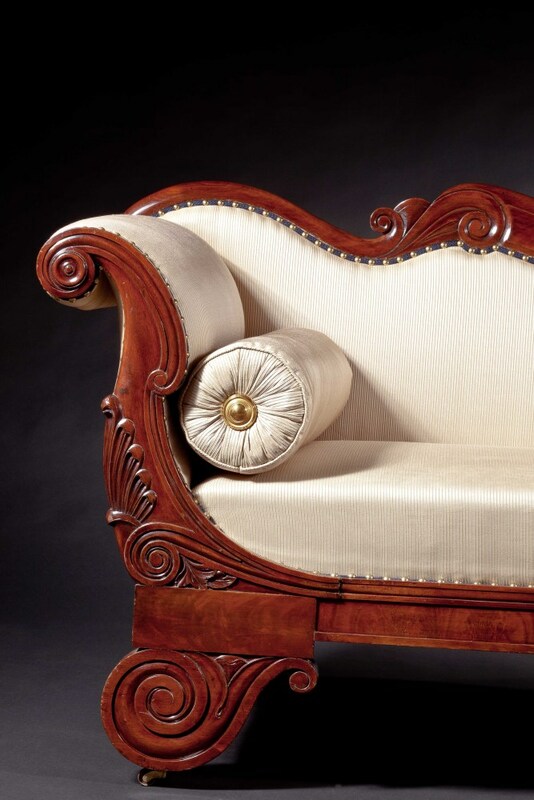 The over all quality of the sofa, the style of carving, and the design of the feet in particular, are associated with one of Boston's greatest cabinetmakers of the period, Isaac Vose. Vose (1767 - 1823) first appears in Boston directories in 1789 as a cabinetmaker on Orange Street. In 1806 he formed with Joshua F. Coats a renowned partnership on Washington Street which dissolved when Coats died in 1819 and he began working with his son Isaac Vose, Jr. (1794 - 1872), who had joined the firm three years earlier. Isaac Jr. continued to be listed as a cabinetmaker on Washington Street until 1825. Recent research identifying Thomas Seymour as the maker of a pair of 1816 card tables with closely related feet to the present sofas suggests that Seymour may have brought the design with him when he became shop foreman for Vose in 1819 after he closed his own shop. The volute foot, derivative of English Regency design, is also associated with Vose's noted rival William Fisk. Fisk, originally in partnership with his father in Salem until the former's death in 1797, worked briefly for the Sandersons before moving to Roxbury to join the colony of craftsmen centered around the Willard clock works. Becoming one of the most prosperous of the group, he is known to have shown four portable rosewood desks at the exhibition of the Massachusetts Charitable Mechanics Association in Boston in 1837. 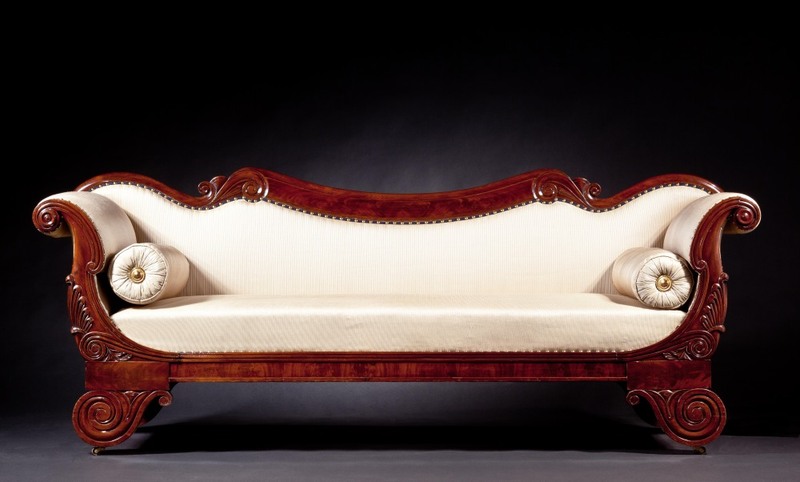 This fluid sofa demonstrates a mastery of design, indicating the work of one of Boston's great makers. Measurements Height: 35", Length: 87�", Depth: 24�"